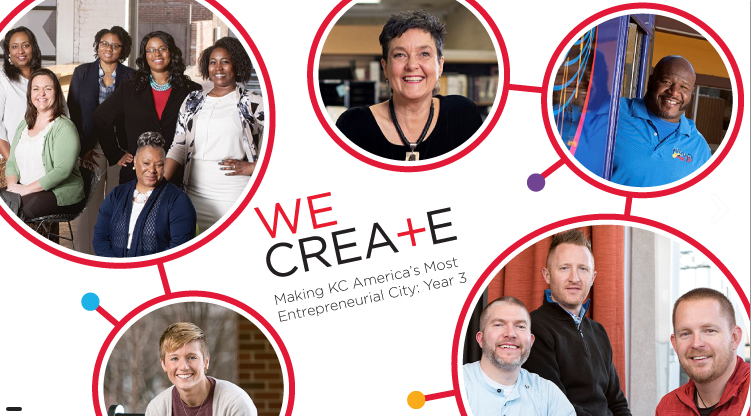 KCSourceLink today released its third We Create KC report, which looks at progress in key areas central to supporting entrepreneurs and business growth in the region. Last year, KCSourceLink, a network of 240+ business-building resources, made more than 155,000 connections to help entrepreneurs and small business owners find the help they need to start and grow. “At KCSourceLink we are committed to supporting the entrepreneurial community—the pioneers, champions and heroes who’ve gotten us to this point. And we’re also committed to tracking the numbers to measure our progress,” said Maria Meyers, founder of KCSourceLink and head of the University of Missouri-Kansas City Innovation Center, of which KCSourceLink is a part. The good news: Kansas City is making progress in terms of access to capital for entrepreneurs, the idea pipeline and resources to support startup growth. The full report can be downloaded at www.wecreatekc.com. OneKC for Women launched a new WE-Lend microloan program. AltCap announced new funds available for contractors and artists. The Microloan Coalition was formed to bring additional dollars to Kansas City area microenterprises. LaunchKC and Digital Sandbox KC provided grants for early-stage businesses. Mid-America Angels and Women’s Capital Connection had their largest year ever in investments. Northland Angel Investor Network got off the ground and iiM focused its funding on human and animal health and agriculture. The Collective and a re-formed Angel Capital Group are providing more options on the local investment scene. KC Rise has announced a new fund that will invest side-by-side with other VCs. Flyover Capital made its first investments. Out of town funds like Royal Street Ventures, Lewis and Clark Ventures and Dundee Capital have set up shop and invested in regional businesses. Moving innovations from universities and research labs into the marketplace is a difficult process. The Whiteboard2Boardroom program has been working hard to improve the innovation pipeline. Launched in 2009 with four partners, that number has expanded to 22. Whiteboard2Boardroom has identified more than 40 projects in the innovation pipeline, from biodiesel to drug development. This is the first time there’s been a clear snapshot of what Kansas City’s innovation pipeline looks like. Kansas City has a strong, interconnected web of resources that support entrepreneurial ventures at all stages and in all industries. During the past year, resource organizations came together to form the Multicultural Business Coalition, designed to better engage diverse business owners with programs and services. The We Create KC report, produced under an award from the U.S. Department of Commerce, Economic Development Administration, covers six imperatives that were identified as key areas of development in the region’s quest to nurture entrepreneurship and economic growth. These six imperatives came out of research conducted by several local organizations, and helped focus this particular Big 5 initiative defined by the Greater Kansas City Chamber of Commerce. Jeff Hornsby received the John E. Hughes Award for Entrepreneurial Advocacy at the recent 2016 USASBE Conference. He is the Henry W. Bloch/Missouri Endowed Chair of Entrepreneurship and Director of the Regnier Institute. 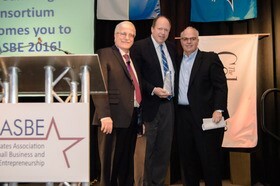 The award, named after its first recipient John E. Hughes, recognizes an individual who has consistently over time contributed encouragement, support, resources, time, development, talent and skills to further the field of entrepreneurship and support structures that nurture emerging and practicing business owners. The United States Association for Small Business and Entrepreneurship® (USASBE) is the largest independent, professional, academic organization in the world dedicated to advancing the discipline of entrepreneurship. With over 1000 members from universities and colleges, for-profit businesses, nonprofit organizations and the public sector, USASBE is a diverse mix of professionals that share a common commitment to fostering entrepreneurial attitudes and behaviors. “Don’t succumb or be deluded by the myth that entrepreneurship is about working for yourself, it’s not. It starts first with the needs of others. If you answer a need of others, are sincere on that and put that first, you will be served well.” This is advice David Brain, inaugural member of the Entrepreneur Hall of Fame. gave in a video that is featured in the hall. Brain, founder of EPR Properties , will share more of his entrepreneurial experiences at 5 p.m. Feb. 3 in the Henry W. Bloch Executive Hall, Room 218. The Regnier Institute for Entrepreneurship and Innovation presents the First Wednesdays series for students and community members. Each presentation focuses on the journey of successful entrepreneurs who capture the innovative mindset of the Henry W. Bloch School of Management. A Kansas City native, Brain has been a strong advocate for the Bloch School’s entrepreneurship programs, having served as a mentor in the E-Scholars program and a judge in the Regnier Venture Creation Challenge. Additionally, Brain serves on the advisory board for the Lewis White Real Estate Center and has been a guest lecturer in several Bloch classes. He was recognized in 2013 as the Regional Entrepreneur of the Year by the Regnier Institute. 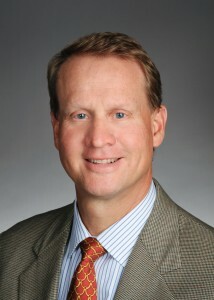 Brain co-founded EPR Properties in Kansas City in 1997 with little more than a computer and two telephones in a few sublet cubicles. The company is a specialty real estate investment fund that builds and leases entertainment, recreation and education properties that traditionally were thought to be too volatile for institutional investment. By 2015, the company had built an investment portfolio of $4.5 billion with more than 240 properties across 39 states, investing in theatres, retail centers, water parks, ski parks, public charter schools and more. The seeds for EPR were planted while Brain attended Tulane University in New Orleans, earning a B.A. in Economics and an MBA. In fact, Brain attributes the success of the company to the ability to identify a market need paired with simple problem-solving. This semester’s First Wednesdays speakers will continue to tie in with the Entrepreneur Hall of Fame, following three fellow inductee presentations held during the fall term. . Bob Regnier, Bank of Blue Valley and Regnier Family Foundation, will present March 2 and Lamar Hunt, Jr., on behalf of the Hunt family, will present April 6. The final First Wednesday event will be the Regnier Institute’s Roo Idea Jump. The competition awards prizes to new, independent UMKC student ventures in the concept stage. For more information on First Wednesdays, please contact the Regnier Institute at entrepreneurship@umkc.edu, by phone at 816-235-6200. or register online to attend.